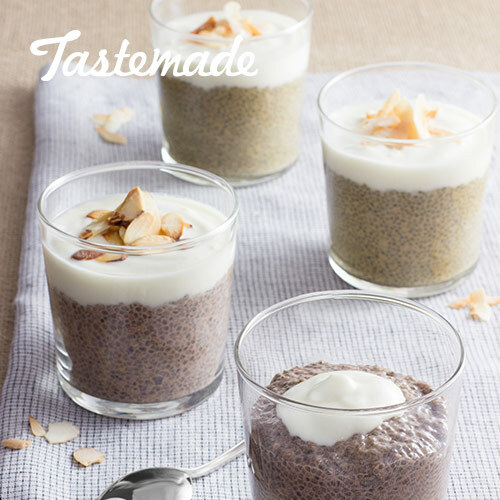 Whisk together milk, chia seeds and honey in a medium bowl; cover and chill for at least 8 hours. Spoon into small bowls and top each with a spoonful of yogurt and a sprinkle of almonds, if desired. Prepare as above steeping 6 chai tea bags in very hot milk in place of chocolate and adding 1 teaspoon vanilla extract. Top with vanilla yogurt and toasted coconut, if desired. Substitute plain milk for chocolate milk. Stir in 1/2 cup finely chopped pineapple or mango, 1/2 teaspoon coconut extract and 1/4 teaspoon rum extract. Top with vanilla yogurt and toasted coconut, if desired.